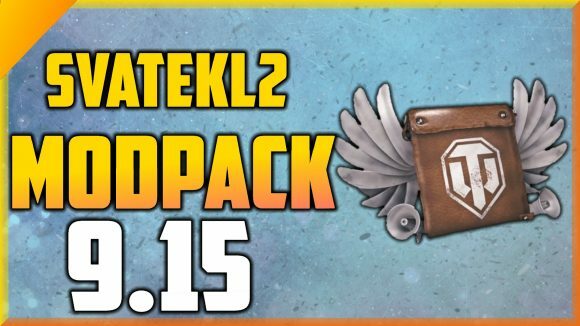 Svatekl2 Mod Pack is unique, it includes in itself a clean and simple installer, with a cool option to import and export your mod pack selection… With that you can get your whole clan to install the same mods as you without having to list everyone one of them. Other than that Svatekl2 is also a famous YouTuber that comes from the NA server. The mod pack includes over 70 different mods and is compatible with the latest game update 0.9.15! Download the mod pack, run it, select the preferred mods, and click install! Where you release new version for 9.6 WOT? until the last modepack i had no problem but the svatekl2 9.6 v5.3 modified my RO version into EN version . i have the last update v5.3 your recomaddation is upgrade… to what? sorry man,i upgrade to the v5.4 but the same rezult…change my RO version to EN version if you can help more than that please do it…. After installing mod my game turns off mid battle, log back in and I’ve missed 2 minutes of the battle. Why? Hey after this recent install I cannot play . I press Battle , then it wont go into the game . It stays where all the names are of both teams . Auto aim action does not work unfortunately in last update 9.12. whats the problem ?? depuis que j’ai installé svaltekl2 sur wot, quand je joue les camouflages ne sont pas sur les chars alors qu’ils sont dans le garage. Y a t’il un réglage à effectuer. help please, when i play the camo of the tanks have disapears. Hello, since my position is on the European server, I want to ask if when I went on the Russian server or Asia, whit you Donator Pack, I can buy tanks that are not normally present on my server. What then, of course, they remain in my garage. Thanks for your Modpack that I find useful and of good quality, and good work. Ok. So i did download v11.3. Than i open it and i still get the msg, that i need to update it. V11.3 seems to be broken. Keeps saying there is a new version available andtakes you back to V11.3 download link. This notice appeared after installing your mod pack and as far as I see, this has nothing to do with you. Why is this notification coming up when it has nothing to do with this mod pack or you? – its from someone else. Yeah…same here…I looked that mod up an it is a Russian Cheat Mod…great I have a cheat mod notice for WG to see! I have your mod pack and love it. I want to try some other mods that are on the list how do I find that list? Second question is when there is an update which option do I select? Thanks for your help and time. do you have modpac for a 9.14 version.????? if you tried reinstalling the MOD pack after you updated to 9.14, then most likely what happened is the MOD pack installed 0.9.13 into your mod_res folder. That’s what happened with mine at least. If you’re not going to go with another MOD pack for now. go [drive letter]( e.g. C:)/games/world of tanks/mod_res and create a new folder named 0.9.14. I love your MOD. I’ve tried others, but IMO they aren’t near as good as yours. I can’t wait for the updated one though. I miss it. Having to use Aslain’s for now. But not real happy with it. When’s the update going to happen? here the same installer crashing on install…..
its not working for me :(, everytime i open it . says cannot respond . . any ideas? Can’t seem to join dynamic platoons in game or request dynamic platoons. Cant join a dynamic platoon in game. Seems to be a bug. Joining platoon in battle doesn’t work 🙁 Please fix. It works fine with other mod packs and in vanila so it must be some bug of this one. Thanks for great pack! Replays dont seem to work either. When i try to play a replay off of Wotreplays.com it gets hung up. It looks like its the XVM hitlog. I removed that and everything works ok now, buy tanks, and load replays. So its in the XVm part of the mod somewhere. Great MOD pack, just using the latest version 12.3 and the feature to mount and demount consumables using F3 key does not work. Any clues? Can not buy any tanks, is there something I need to do? Please advise. just go to xvm.com download the latest mod and install over svatek mod. Dosent change anything in the mod. Worked for me. can you add SMG alert six sense sound. i used to that sound but i like your mod pack. Gambiter’s hitlog and the lightbulbs aren’t working for me since the last update. Don’t download the last update (rubicon). It doesn’t work and need windows Smartscreen needs to be deactivated. Virus ? What a great reading about god, btw i belive in him, but WE ALL KNOW THE WORLD IS BAD and only good people makes good things and im a good guy. But sometimes good guys need to play and have fun, sometimes i go to pool or party but im not bad for that. Im not killing people, dont steal money and I dont harm people and Im not an angel for that. Im normal man. Be normal too… i dont know how many time you spent in wot… me also spent many hours in game and not in my company (selfempoyer I am) but please dont try to be the best person in world. Be just good and think. Downloaded from link, booted up but says needs to update, clicked ok, and went to same place for download, but same thing, and there only 1 place to download it. mediafire. am i missing something? It seems like every time I start using a mod pack they stop being updated after the next game update. Used this pack for a couple of weeks and then once the game updated they haven’t bothered to update the pack. I get so tired of this.